Only the GossipingPropertyFileSnitch is supported for managing or importing DataStax Enterprise clusters in Lifecycle Manager. See Migrating from the PropertyFileSnitch to the GossipingPropertyFileSnitch. Lifecycle Manager currently does not support configuring nodes by network interface (listen_interface or rpc_interface/native_transport_interface). 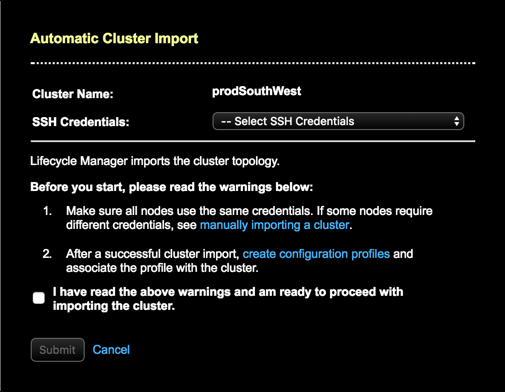 If a cluster is configured with those options, the import will fail. Reconfigure the nodes by listen_address and native_transport_address rather than the corresponding interface options before importing the cluster. If Transparent Data Encryption is enabled, it must be disabled prior to importing the cluster into LCM. See Encrypting configuration file properties.